Terex Materials Processing continues to implement a series of strategic moves and investments to better position its purpose- built Fuchs material handler business for global expansion and sales growth. Recently, the business was rebranded ‘Fuchs – A Terex Brand’ in key markets for consistent global brand recognition. 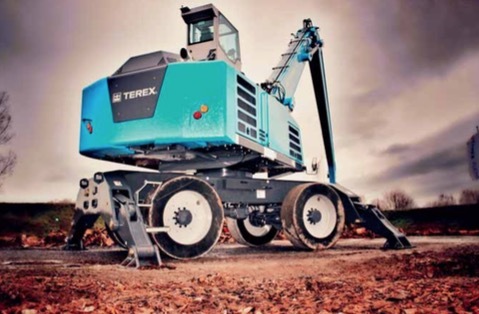 The Fuchs line also transitioned to the Terex Material Processing segment, which is a better strategic fit for the business within the broader Terex portfolio. Additionally, multiple new machine introductions were made at key international trade shows during the first two quarters of 2016, including the ISRI 2016 Convention in Las Vegas, Nev., USA and Bauma and IFAT 2016 held in Munich, Germany. Commenting on several recent strategic sales and support actions taken to increase material handler customer support, Ron de Vries, General Manager for the Fuchs business globally, said,“In conjunction with the transition to Materials Processing, we appointed Jon Van Ruitenbeek as the new Business Line Director for Fuchs in North America, and we have announced several key sales and support management appointments for key North American and European markets, which will give Fuchs more interaction with customers during the sales process and provide customers with a higher level support from the factory. Accelerated investment in Fuchs’ new product development with a number of new initiatives has resulted in multiple announcements of new models and model upgrades. Two completely new model class designs recently introduced — the Fuchs® MHL390 F and MHL370 F — give customers more material handling options to fill a wider variety of application needs. Designed to deliver the long reach and high lift capacities required in port applications globally, the new Fuchs MHL390 F handler boasts operating weights ranging from 76.2–87 metric tonnes (168,000 to 191,800 lb). It features a broad outrigger base to provide excellent stability when lifting heavy loads at extended reaches of up to 24.5m (80.4ft). An available banana boom configuration enables the handler to effectively reach deep into a vessel’s hull for port applications. The new 55-tonne (120,000 lb) class high-capacity Fuchs® MHL370 F handler boasts a reach of up to 18 m (59.9ft), giving the North American market a much needed machine to fill the production demands of large, high-volume scrap operations processing material with mega shredders. The MHL370 F delivers increased lift capacity over the smaller Fuchs® MHL360 F level operation of 6.1m (20ft) and independent cab forward movement of 2.2m (7.2ft), which is critical for port applications. Fuchs also introduced to a global audience at IFAT upgrades to its wildly popular MHL320 F handler, designed as the perfect entry level unit for recycling, solid waste and small scrap operations who need the high lift capacities at extended reaches, efficient sorting capabilities and fast trailer loading/unloading only delivered by purpose-built handlers. Additionally, the business segment unveiled the new purpose-built Fuchs cab design at ISRI that will hit the market in the fourth quarter of 2016. The sleek new cab design incorporates more glass to advance visibility, new joystick steering control for improved manoeuvrability and a revised interior for more space and greater operator comfort. Another cornerstone to the Terex growth strategy for the material handler product line is to make more use out of the Fuchs Application Center at the machine manufacturing facility in Germany. It’s here where Fuchs team members work closely with customers to design one-off handling solutions to meet specific application needs. Beyond the standard product line offering, Fuchs gives customers the opportunity to optimize and adapt the material handlers to meet the specific needs of the application. A complete team consisting of Fuchs distributors, sales representatives, engineers and technicians works closely with the customer with one common goal in mind: custom design a machine for the best fit to a specific niche need of the customer. Fuchs material handlers are built with standardized components as the foundation of a modular system that allows engineers to design a wide variety of machines that offer the same durable and efficient operation that customers have come to expect from standard Fuchs machines. In addition to the model’s standard options, the Application Center can build a machine with either a wheeled or crawler undercarriage. The diesel engine can be replaced by an electric engine with cord length adapted to the customer’s needs. A pylon riser of varying lengths — popular for port applications — can be added between the machine’s upper and lower carriages for enhanced visibility. Additionally, if a stationary model is the best fit for the customer, the upper carriage of a handler can be adapted for stationary applications through the Application Center.